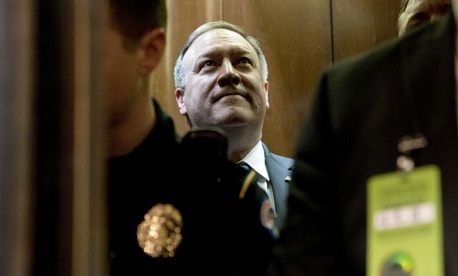 Amidst the policy discussions of such grave issues as the North Korea threat, the Iran nuclear accord and the U.S. use of torture, Thursday’s confirmation hearing for Secretary of State nominee Mike Pompeo devoted significant attention to management challenges at Foggy Bottom. When pressed about the State Department’s high vacancy rate, exodus of experienced talent and low morale, Pompeo, the current CIA director and a former House member, appeared eager to ease some of the workforce pain. But he would arrive to find enormous challenges. Sen. Johnny Isakson, R-Ga., chairman of the Foreign Relations Subcommittee on State Department and USAID Management, praised Pompeo for his leadership at CIA, and challenged him to similarly address State’s sinking morale if he is confirmed. Pompeo declined to address hypotheticals but stressed his plan to be a “talent hawk” for “building a team” and find “the best fit” for vacant jobs, including 37 ambassadorships. He would start with identifying “the biggest gaps” and “encourage, command and cajole” to recruit Foreign Service officers and civil servants, as well as qualified outsiders for all of State’s functions, including diplomacy, humanitarian assistance and development. Pompeo would face a tremendous challenge. An analysis by Government Executive in February found that the department lost 12 percent of its foreign affairs specialists during President Trump’s first eight months in office. Overall, State’s civilian workforce shrank more than 6 percent over that period. In the run-up to Pompeo’s confirmation hearing, the nonprofit Partnership for Public Service compiled numbers showing that under departed Secretary Rex Tillerson, State received the lowest employee engagement score it’s ever received in the partnership’s “Best Places to Work in the Federal Government” rankings. This represents a 2.8-point decline from 2016 and the first time that the department has not been ranked in the top five large agencies since 2011, the group said. Through a combination of White House inaction and Senate confirmation politics, the pace of appointments is at a record low. Of the 161 key, Senate-confirmed political appointments at State, 61 positions still have no nominee, four are awaiting a formal nomination to the Senate and 27 positions are awaiting Senate confirmation, as of early April, the partnership said. Also awaiting the next secretary are decisions on whether to continue, modify or abandon Tillerson’s touted reorganization plan, which appeared to lose steam in Tillerson’s final days as Congress declined to implement related budget cuts. Earlier this month, internal documents obtained by Politico showed that Tillerson had spent $12 million on as many as 90 outside consultants to help with his intended efficiency-creating “redesign.” A Senate Foreign Relations Committee hearing on the reorganization scheduled for March 15 was canceled. Within State’s bureaus, critics remain wary of the Trump administration’s perceived disregard for career expertise. The ranking member of the House Oversight and Government Reform Committee, Rep. Elijah Cummings, D-Md., in March joined with Foreign Affairs Committee top Democrat Eliot Engel of New York, in writing the White House demanding documents on efforts alleged by a whistleblower portraying Trump conservative activists as “targeting” career civil servants perceived as disloyal to Trump. Pompeo might also have to address a reported effort by the White House to centralize the approval of promotions at the State Department. If confirmed, Pompeo could rely on the newly re-designated Deputy Undersecretary for Management Bill Todd for personnel issues. Pompeo’s confirmation is by no means assured, as the Foreign Relations Committee and the full Senate are nearly evenly divided between the parties, and Sen. Rand Paul, R-Ky., has already come out against Pompeo, citing his perceived saber-rattling and past support for “enhanced interrogation techniques” by U.S. operative against suspected terrorists. Panel Chairman Bob Corker, R-Tenn., an enthusiastic supporter of Pompeo, said he is hoping for a vote the week of April 23.